Jason Bittle’s article about Grandma got STEM in Slate.com features the picture above, courtesy of Argonne National Laboratory. 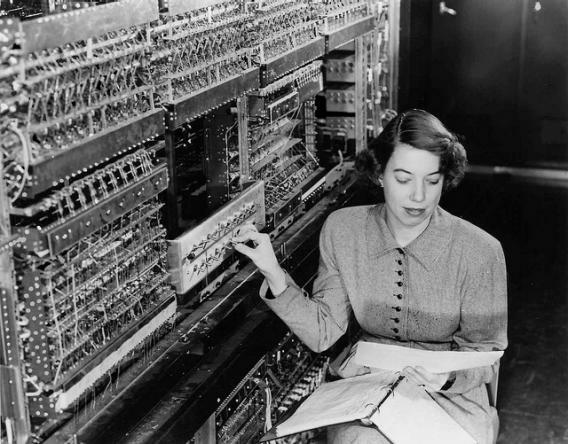 The caption indicates that the woman’s name is Jean F. Hall and that she was a computer scientist at Argonne. The Argonne National Labs website indicates that she was a “pioneer Argonne computer scientist” working on the AVIDAC, Argonne’s first digital computer, which began operation in January 1953. Does anyone out there know more about Jean Hall? Her picture appears often, but I have not found further information about her work. So I guess I am posing the second #ggstem challenge! Way to go, Renee! The article on Margaret Butler is fantastic. I have contacted the writer, Holly Stump, about submitting a post about her to #ggstem. Check this out — this article says the ENIAC “computers” (programmers) were all women, called “Rosies”!